such, it is very successful because of its powerful jet blaster effect. In most cases, because of its efficiency, hydro blasting will require only one operator for a given application. Pressure and Flow both play key roles in an efficient high pressure water jetting machines, and applications respond differently to each variable. Typically, hardened deposits respond better to higher pressures, and softer materials are best removed with higher flows. Each application is unique, though, and we can help you determine which combination of pressure and flow will work best for you. Aqua blasting is the method, by which a high pressure stream of water (450 bar or more) is used to remove old paint, rust, rubber, chemicals, or other heavy build up without causing damage to the surface below it. This method is perfect for internal and external surfaces because the spray gun operator is able to access those "hard to reach" areas (such as pipelines). Also, because of its strong water spray, the user can keep a safe distance from the surface being cleaned. One of the major differences between water blasting and other cleaning abrasives (such as silica sand, coal or smelter slag, metallic, synthetic, organic nut shells or fruit kernels) is the ability to contain, capture, filter and reuse the water. This eliminates waste water and contaminants after the cleaning. Extremely high pressure systems (2800 bar or greater) are used for concrete cutting. If your requirement is high pressure, high water volume and high temperature output machine, then your answer is in heavy duty water jetting pressure washer. Due to the high removal and cleaning power, these High pressure water jetting machine equipments pay for themselves after a very short period of time. Hydro blasting equipments are ideal for specialized service providers, construction companies, renovators and for industry. 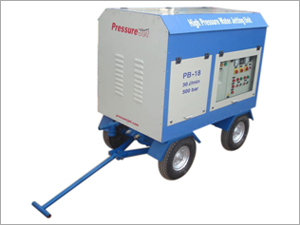 This High pressure water jetting equipment consists of bare pump, electric motor and starter, pressure regulating valve, safety valve and pressure gauge. Other accessories include suction hose, delivery hose, foot valve/gun, nozzles, rigid lance and flexible lance. Advantages: Reduction of plant downtime, labour saving, plant protection, water conservation, no need of chemicals and non hazardous. Applications: For cleaning of rotary kiln, agitators, riser ducts, turbines, cooling towers, pump impellers filters and hoppers, mixers, ship hulls, conveyers, etc.